We checked in with SELF magazine's contributing experts Willow Jarosh and Stephanie Clarke, registered dietitians and co-founders of C&J Nutrition, to the get the health scoop on why you should be snacking on these delicious super treats. 1. They're packed with antioxidants. Tart cherries, also called sour cherries, are rich in antioxidant compounds including anthocyanins and quercitin, which may play a role in reducing total body inflammation as well as fighting free radicals. 2. They soothe sore muscles! Tart cherries have been getting a lot of attention lately based on new research suggesting that they may speed recovery and relieve muscle aches and pains after working out. In one study, one group of participants drank 12 ounces of tart cherry juice, two times per day, seven days before running a long race, while another group drank a placebo cherry-flavored drink. The group that drank the tart cherry juice reported significantly less pain following the race.Clarke and Jarosh add that while tart cherry juice is the type that has been involved in the research so far, sweet cherries are also packed with other antioxidants and nutrition -- they just haven't been the subjects of as much research yet. Many companies are selling tart cherry juice without added sugar, but it's pretty tart, say Clarke and Jarosh. But it's also sold as a juice concentrate, so you can choose to mix it into other foods (like a smoothie) to temper some of the tartness. 3. They're rich in vitamins and fiber. Since cherries (both tart and sweet) are a good source of vitamins A and C and fiber, they're a nutritious fruit to include in your diet as another way to strengthen your body's defenses and improve overall health. 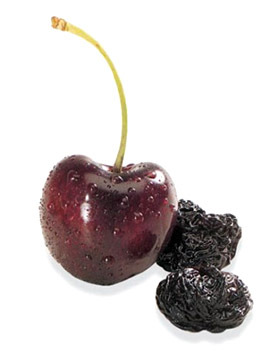 If fresh cherries aren't available at your grocery store (yet), here are some of Clarke and Jarosh's tasty ways to incorporate cherries into your diet: - Add dried cherries to cereal, yogurt parfaits, pancakes, muffins and breads. - Top salads with dried cherries. - Make a cherry crisp and top with Greek yogurt for dessert.